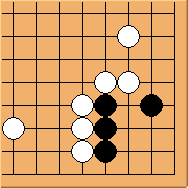 Go Eye is a relatively new IOS Go application on the market. But in my opinion it is the best. 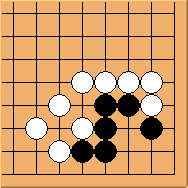 It contains a number of innovative ideas that help Go players organise the vast amount of Go resources on the internet. SGF viewer and editor Go Eye is first of all a full-fledged SGF viewer and editor. Let's have a look at the following screen capture because "a picture is worth a thousand words". All serious Go players practice life & death problems. The question is: should we study textbooks or real games. I personally prefer the latter as real games often contain additional factors that influence our decisions on local life & death situations. The Under the Stones tesuji is quite rare in professional games. There are only few examples. Under the Stones (倒脱靴 in Chinese; 石の下 or ishi-no-shita in Japanese) refers to situations in which brilliant moves become possible in space left by your stones just captured. 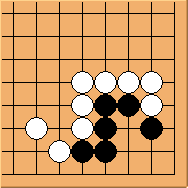 These shapes are mostly seen in (artificially designed) tesuji problems. But in practice it does occur from time to time, even in professional games. This is yet another 'incomplete' Carpenter's Square. 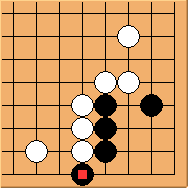 Because of the external liberty, a ko would be an acceptable outcome for white. This shape is very similar to Shape 30.